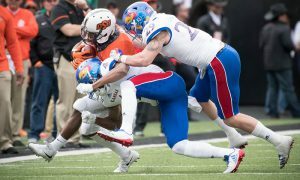 We now take a closer look at the Oklahoma State Cowboys, who begin year fourteen under head coach Mike Gundy and are coming off an 10-3 season with a Camping World Bowl win in 2017. 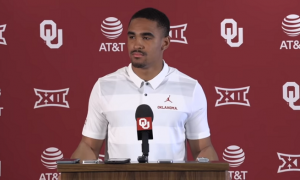 With Mason Rudolph and James Washington gone, how will the 2018 season playout without them? Is the defense improved? 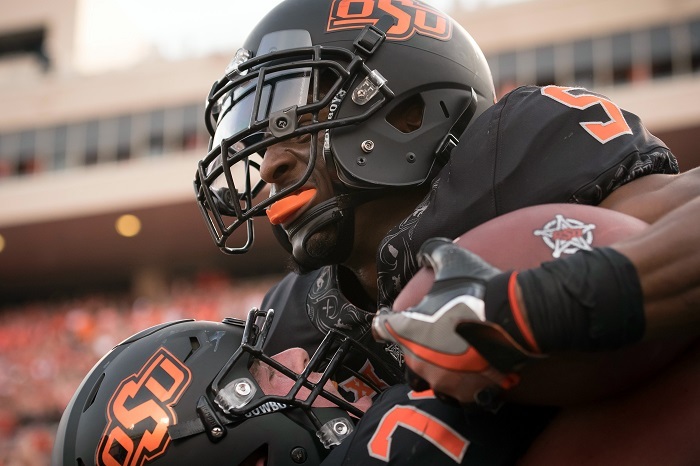 Let’s look at the best and worst-case scenarios for the 2018 Oklahoma State Cowboys. Either quarterback Dru Brown or true freshman Spencer Sanders take the starting job and run away with it. Not only will one run away with it, they have a fantastic season. 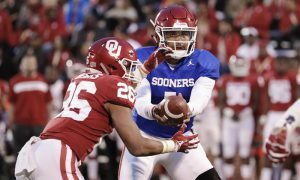 In Dru Brown’s case it would be having a one year hit because he is a grad transfer while Spencer Sanders sits and learns, or Sanders lives up to the hype. Throw in arguably the best running back in the Big 12 (Justice Hill) and the high powered offensive tradition continues in Stillwater. Seriously though, Justice Hill could rush for 1,500 yards this season. 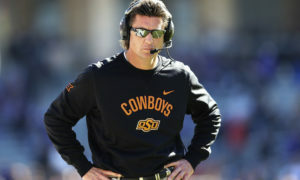 Meanwhile, the defense improves with new defensive coordinator Jim Knowles. The defensive line depth comes in handy for a long season and helps turn things around. Throw in a breakout year from LB Calvin Bundage and it could be all smiles for the Cowboy faithful. The 4-2-5 defense turns out to be a success. Let’s pump some sunshine, shall we? The Cowboys start off RED hot and get off to a 5-0 start. 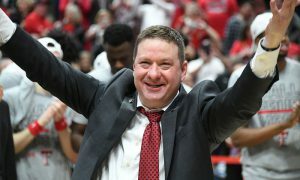 They defeat Missouri State and South Alabama at home with ease. Follow that with a two interesting games against Boise State before kicking off Big 12 play against Texas Tech at home. For those who don’t know, the Pokes first four games are at Boone Pickens Stadium. The fifth straight win comes against Kansas in Lawrence (YAWN). Then things may take an interesting turn. Before their bye week they travel to Iowa State before hosting Kansas State at home. Let’s say they split those two putting them at 6-1 before the bye week. The last five games are going to be crazy tough. 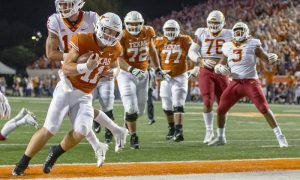 OSU will host Texas after the bye but an improved Texas team catches this rebuilding Cowboy team and beats them for the first time since 2014. Following a tough loss, the Cowboys bounce back and beat Baylor on the road before the iron gauntlet where they play Oklahoma, West Virginia and TCU. Best-case scenario (IN MY OPINION) they go 1-2 during the final three games. That puts this “rebuilding” year at a final record of 8-4. 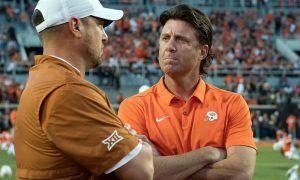 I’m sure many Cowboy fans will want to sharpen their pitchforks, but I see this season a lot like the 2014 season for Mike Gundy. Dru Brown and Taylor Cornelius can’t get the job done forcing true freshman Spencer Sanders to be thrown into action right away. Justice Hill rushes for 1,000 yards but the lack of a consistent passing game sets the offense back. Meanwhile, the defense is still figuring things out under new defensive coordinator Jim Knowles. Let’s throw on our negativity shades, shall we? No matter how dark these negativity shades are, the Cowboys will start 2-0 against Missouri State and South Alabama at home. Then comes the big test against Boise State at home before taking on Texas Tech at home as well. Worst case, I’ll say they split those two putting them at 3-1. Follow that with a snoozer against Kansas in Lawrence and 4-1 doesn’t sound too shabby, right? Then the boat starts to sink and sink fast. 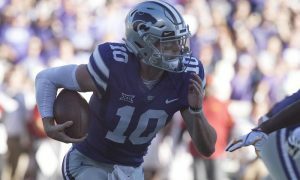 The Cowboys host an interesting Iowa State team at home but fall short and Kansas State is able to get the best of them as well before the bye week. That’ll put their record at 4-3 before the break. At this point, the team is starting to bend but soon it will break. They lose to an improved Texas team but bounce back above .500 after a road win against Baylor. The season finally wraps up with three straight games against Oklahoma, West Virginia and TCU. The Cowboys could easily go 0-3 during that stretch putting the final record at 5-7. The Cowboys first losing season since 2005.